Found black & white cabinet card of a Texas cowboy ice skating around 1885 (though the original photo was shot in a photo studio with fake scenery and no snow.) 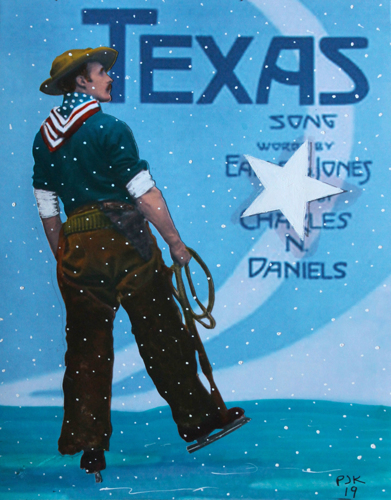 Image was blown up, cut out, colored (acrylics, markers, ink pen, paint pen) and mounted on a repurposed (copy of) a song sheet of Texas songs. Snow is gratuitous. I used a single lone star (mandated on all Texas flags) which represents ALL of Texas and "stands for our unity as one for God, State, and Country," but probably not illegals. They'll get in "when hell freezes over." Oops. The Rio Bravo is froze. Oh God, now what do we do?